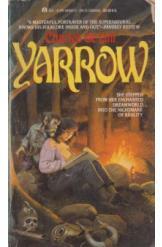 Yarrow by Charles De Lint, Sci Fi. Book is in good condition, all pages intact. Cat moves between two worlds - a mystical realm full of strange creatures, and our mundane world - and isn't quite sure which one is real and which one is a dream. The answer comes brutally, in the form of a thief.